Philippe o Fraunce, Duke o Orléans an only brother o Louis XIV, bearing the cross o the Order o the Haly Spirit with the croun o a Son o Fraunce. 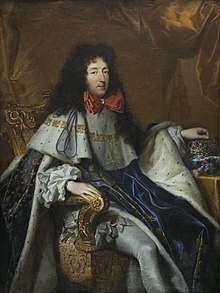 Philippe o Fraunce, "Son o Fraunce", Duke o Orléans (21 September 1640 – 9 Juin 1701) wis the youngest son o Keeng Louis XIII o Fraunce an his wife, Anne o Austrick. His aulder brither wis the famous Louis XIV, le roi soleil. He wis the founder o the Hoose o Orléans. He also inherited a vast fortune frae his cousin Anne Marie Louise d'Orléans, Duchess o Montpensier, "La Grande Mademoiselle". Élisabeth Charlotte d'Orléans (13 September 1676 – 24 December 1744) mairit Léopold o Lorraine, Duke o Lorraine an haed childer. 21 September 1640 – 14 Mey 1643 His Ryal Highness The Duke o Anjou, Son o Fraunce. 14 Mey 1643 – 2 Februar 1660 His Ryal Highness Monsieur, Duke o Anjou, Son o Fraunce, Anly brither o Keeng. 2 Februar 1660 – 9 Juin 1701 His Ryal Highness Monsieur, Duke o Orléans, Son o Fraunce, Anly brither o Keeng. This page wis last eeditit on 13 Apryle 2019, at 22:00.